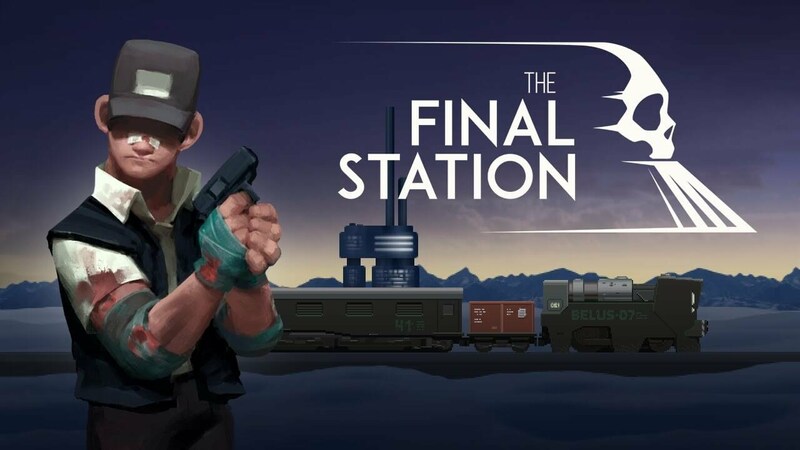 The Final Station is the first of a half dozen upcoming games recently announced being ported to the Nintendo Switch from developer tinyBuild. It is an interesting blend of horror, shooter, and…train simulation? We begin the game as an unnamed train conductor working his way through an ominous facility, eliminating dark shadow creatures that seem to be taking over what could be a military headquarters? You work your way through with relative ease, but it ultimately climaxes when you take a ladder down to a sub-basement and drop into a room literally filled with too many shadow creatures to count. The screen fades to black, and we next find ourselves controlling another (?) train conductor. Our initial goal finds us trying to manage the train between stops by making slight adjustments to the instruments, and checking up on the passengers. Passengers have health and hunger bars, and delivering them safely to their destination results in being rewarded cash to be used for materials and upgrades. There is a food and medkit machine on board, and when you start getting low, you can craft more of the resource using materials obtained when exploring the town surrounding your next stop. Every time you get to a new station, you reach the majority of the gameplay. You will be tasked with acquiring the code to launch the train to your next destination, but are also highly encouraged to explore beyond that. Tiny Build encourages this by making it necessary to talk to everyone to not only ascertain what your code is, but also to find survivors that serve as your passengers, sources of information about what is going on, and also to search the nooks and crannies of the towns for materials. When we get to each destination, we learn more and more. First, there is scuttlebutt about bad things going down in towns further along the route. Then, we learn that conductors are now permitted, and encouraged, to become armed to deal with any situations that they may encounter. This narrative choice to Dole out information through NPCs and computer messages really makes the world feel alive, even if it is on the throe of death. During our frequent treks, we come across more and more of the shadow creatures, and the game’s difficulty level steps up considerably. However, it is still satisfying, and deaths never feel cheap. You just have to approach it from a new angle this time. As can be expected with a horror game, ammo is in short supply, and seeking out more becomes absolutely necessary. To aid us in our quest to defeat the shadow menace, we are also given access to a weak melee attack that serves to push the creatures back, and are often provided with throwable objects that can be used in place of bullets. The controls take a little getting used to, but they’re fairly intuitive. You must aim your gun with the right stick, and fire with ZR. L reloads your pistol, and ZL picks up whatever pieces of the environment that you can to throw. There is no jumping in the Final Station, but you become accustomed to this pretty quickly as it doesn’t really affect how you interact with the sidescrolling world. You will automatically leap over steps, and there are many ladders to ascend and descend to traverse through the levels. While the train sim portions are the game’s weakest points, it is still a fun little distraction from combat and town exploration that keeps you on your toes while traveling between destinations. At least, it seems little more than a pleasant distraction, at first. As the game goes on, you acquire more and more passengers, and never enough resources to keep everyone healthy and fed. This results in some pretty depressing moral choices that really make you think. Is helping the weak and vulnerable still a good idea if you can instead help out the person that carries the bigger reward? Should you just conserve your resources for those select few so that you can loot their corpses? The only other drawback I found, is yet again a plus, and that was inconsistent hit detection when it came to the shadow creatures. Sometimes, they would one hit kill me on impact. Other times, I could run past them to loot a locker unscathed, only to try to run back past them to get killed once again. I somewhat feel that this may have been by design, however, because it creates a sense of unease and tension that lends itself well to the horror aspect of the game. Should I risk running past them when I am low on ammo in an attempt to make my escape, or should I shoot my way out and hope to make it back to the train before they get me? Overall, The Final Station has a lot more going right than wrong, and it is definitely a must own if you’re into horror games. The dark atmosphere is perfect, even if the grey and black color scheme is a bit drab and oppressive. The story is fascinating in the way that it unfolds through hearsay and vague warnings from military brass about what just may lie ahead. Its focus on the grey areas of morality under dire circumstances is a much scarier beast than any shadow creature could ever hope to be.